-Drawing of ceramic soffit No. 30 for the Pujol i Bausis factory catalogue. –Pere Mata Institute: Exterior decorative ceramic panels composed of silhouetted stencil tiles. He collaborated with Pujol i Bausis in the design of tiles for ceramic soffits. –Barbey House in La Garriga: Fireplace and other exterior and interior ceramic and trencadís mosaics. –Comalat House (Avinguda Diagonal, Barcelona): Exterior and interior ceramic mosaics. 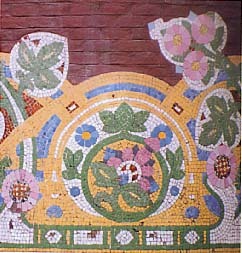 -Garí House (Passeig de Gràcia, Barcelona): (disappeared house) Interior roman and ceramic mosaics. 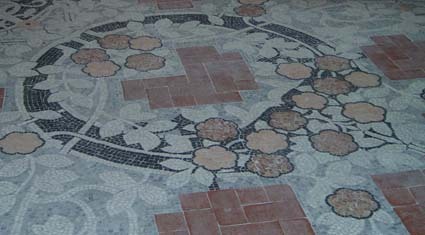 –Lleó Morera House Barcelona): Roman, ceramic and trencadís floor and wall mosaics. -Sentmenat Cemetery (Vallès Oriental): Exterior ceramic and trencadís mosaic. -La Rotonda Building (former Hotel Metropolitan, Barcelona): Partially preserved exterior ceramic mosaics. 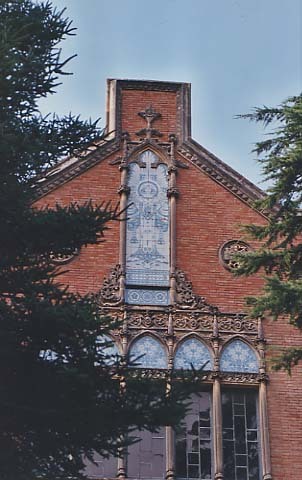 –Hospital de Sant Pau (Barcelona): Exterior decorative ceramic panels with silhouetted stencil tiles. -Carmelite Church (Avinguda Diagonal , Barcelona). -Church of Sant Josep Oriol (Barcelona). 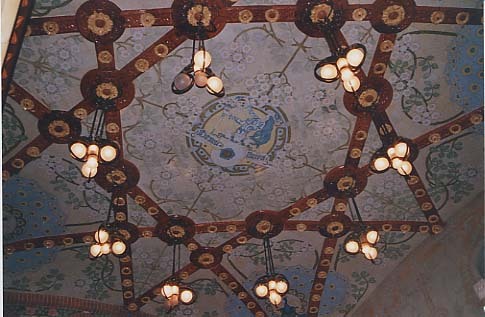 –Pere Mata Institute (Reus): Floor and wall mosaics in the Pavilion of the Dignitaries. Exterior ceramic decorative panels composed of silhouetted tiles. -Lactància Municipal (Gran Via, Barcelona: Roman ceramic, and trencadís exterior and interior mosaics. 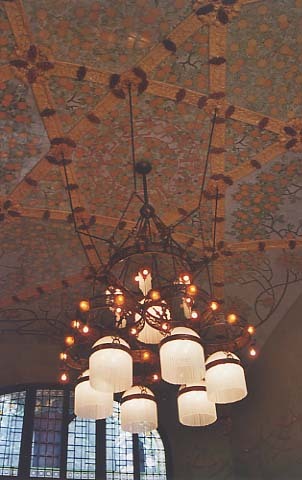 –Palau de la Música Catalana (Barcelona): Roman ceramic and trencadís exterior and interior mosaics used on columns. -Temple Expiatori of Tibidabo ( Barcelona). Born in Ondara, Valencia in 1868. His grandfather and father were both painters, and perhaps in an effort to continue the family tradition Lluís Brú developed his artistic sensibilities at early age. He moved to Barcelona while still a child, but there is no information available about his activities until the end of 1900, when he was 33 years old. His work as a stage designer:* Picture from “Lluís Brú, fragments d’un creador” by Marta Saliné and other authors, Scene of “Hänsel i Gretel” for Teatre del Liceu (Opera Theatre) in Barcelona year 1901, 41 x 30 cm, AMEL. Found Taller Lluís Brú. 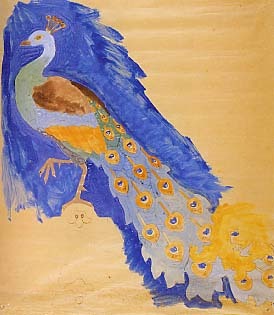 In 1901, Brú worked as a stage designer at the Gran Teatre de l’Opera (Liceu) in Barcelona. 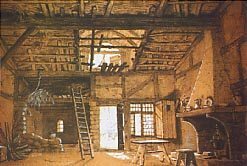 In this capacity, he designed several sets for the production of Hansel and Gretel, of which two drawings survive – the children’s bedroom featured during the first act and the forest in which they lose themselves in the second act – in the Municipal Archive in Esplugues de Llobregat near Barcelona. 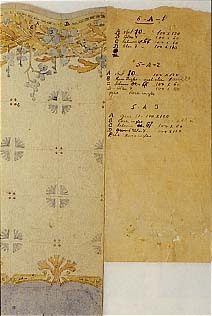 These drawings, signed by the artist, were commissioned by Maurici Vilomara according to dedications written by Brú on the back. 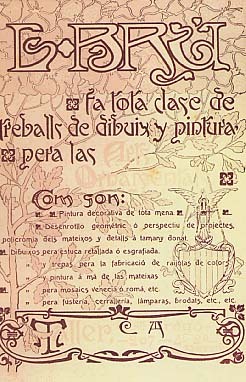 One of his most well-known artistic endeavors was his work for the Pujol i Bausis ceramic factory in Esplugues de Llobregat, for which he created numerous designs. He also received commissions from architects Lluís Domènech i Montaner and Josep Puig i Cadafalch. 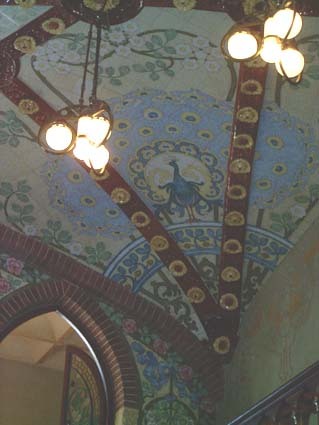 Many of his elegant tile designs, used frequently during the height of the Art Nouveau period, can be seen in the factory’s catalogues as well as in the buildings such as the Palau de la Música Catalana, the Hospital de Sant Pau, the Institut Pere Mata in Reus, the Lleó Morera House, La Rotonda, and others. These achievements, on such emblematic buildings, give some idea of the artistic prestige attained by Brú in his time. cm, AMEL. Found Taller Lluís Brú had already made contacts with Lluís Domènech i Montaner, and it appears that it was this architect who directed Brú into creating mosaics. Brú’s first workshop, on Universitat street (now Enric Granados street), was devoted almost solely to that medium. 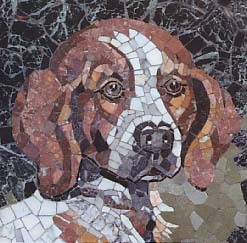 In 1904, he travelled to Italy to be trained in mosaic technique. 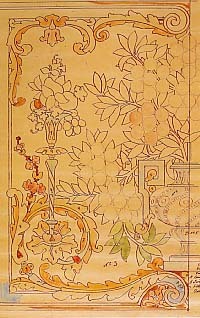 During the Art Nouveau period, Brú spent most of his time completing orders commissioned by great architects and destined for their important buildings mentioned above. 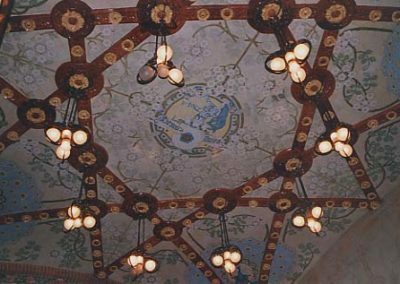 These commissions comprised large decorative panels for facades and interiors, columns covered in fantastic mosaic designs, and spectacular ceilings and floors for grand public and private buildings, among others. 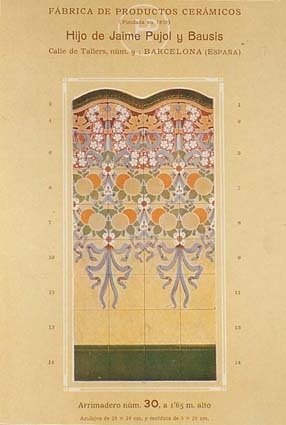 Later, when Noucentisme replaced Art Nouveau as the dominant style, Brú adapted to the new currents by creating smaller panels, furnishings, flooring in the style of Roman mosaic, and all types of decorative elements. Brú’s work enjoyed such wide recognition during this period that his activities extended not only to the aforementioned luxurious buildings, but also to factories, shops, and private homes, in a process that widened the diffusion of the art of mosaic as a decorative element. In 1911, Lluís Brú won a first-place medal at the International Art Exposition in Barcelona with a fireplace that represented St. George, designed by artist Josep Triadó. At the International Exposition of the Decorative Arts held in Paris in 1925, he won the Gold Medal for his fountain covered with mosaics. With slight disruptions generated by economic crises, especially that of 1929, the Lluís Brú workshop continued working on the creation and restoration of mosaics on major works such as the Carmelite Church on the Avinguda Diagonal, the Church of Sant Josep Oriol, the Temple of Tibidabo, and others. 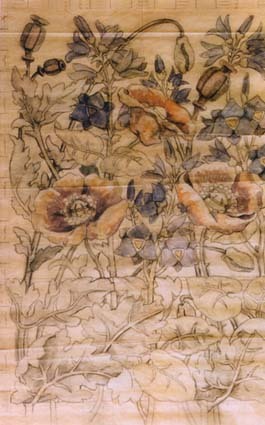 It continued this work not only until Brú’s death in 1952, but even through 1999, when his last descendant passed away. Outside of Catalunya, in Palma de Mallorca, Lluís Brú created the mosaics at the Casa Arab. 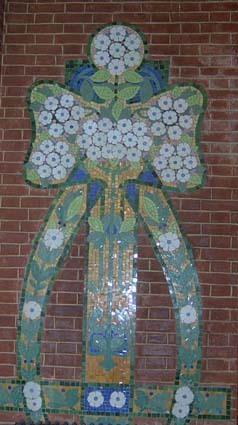 For all of this immense output, Lluís Brú is considered the most important mosaicist of the Catalan Art Nouveau. * Photos published with permission of the Municipal Council of Esplugues de Llobregat. **Photos published with permission of the Municipal Office of Tourism and Commerce of Reus.